KERNOW’S THE TIME FOR ACTION! Young Cornish garage-punks THE BLACK TAMBOURINES are to unleash their second album next month. Having reissued the band’s debut last year on expanded CD, Easy Action are to release Freedom on 4 September on CD, vinyl download and cassette. 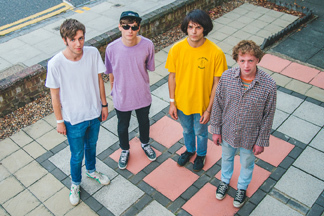 Scorching out of Falmouth in 2010, The Black Tambourines initially released their debut album in 2013, quickly identifying them as leaders of a new wave of Cornish acts. The following year saw them touring the UK and Ireland with THE JESUS AND MARY CHAIN as well as playing the Glastonbury, Isle of Wight and Great Escape festivals, the latter a guerilla gig from the back of a lorry! Having made their mark on Manchester Psych Fest in June, the band go on to play The Brewhouse, London (22 Aug); the End Of The Road Festival, Dorset (4-6 Sept); and a homecoming show at Falmouth’s largest venue, The Princess Pavilion on 30 Oct. Check out the new single ‘She Don’t Mind’. ‹ RADKEY UNLOCK THEIR DEBUT!